Raised in Washington D.C., Amy has been around the political arena her entire life. She always knew she would run for office at some point, and when the opportunity presented itself to run for Deschutes County Commissioner, she knew immediately that this was the position she had been groomed to hold. Amy, a registered Democrat, was raised by conservative Republican parents and learned early on the need to truly listen to everyone seated at the table. Her ten years working as an R.N. and hospice nurse fueled her desire to reform health care and make it more accessible and affordable. Amy spent a great deal of her adult life owning and managing several successful businesses, where she learned critical fiscal and staff management skills. As a 21-year resident of Bend, Oregon, she is deeply committed to managing our inevitable growth in Central Oregon and preserving the quality of life and natural landscape we all love and are accustomed to having nearby. Amy is a CASA volunteer, Board Member for Healthy Beginnings, a nurse and an active member of our community. As your County Commissioner, Amy’s priority is to listen and work with you to work on solving our problems in affordable housing, health care, jobs, and transportation. It’s time to stop talking and get to work on the issues affecting all residents of Central Oregon. 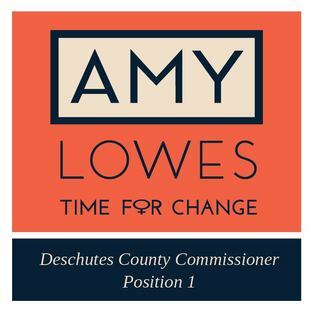 Amy's main objectives are to help ensure affordable and fair housing pricing, adequately fund social services, make health care more affordable, increase access to mental health services, strengthen support for our first responders, thoughtfully manage County growth, and help local businesses thrive.